The size of your Dutch oven definitely matters. And when considering your next Ditch oven you should be aware of a few key factors to look for. So, Which Size Dutch Oven To Buy? Well, in this article we’ll be discussing just that. Furthermore, you may be reconsidering your purchase if you bought the wrong size cookware. So in this article, we will be answering the question of which size Dutch oven to buy? Purchase too big of a Dutch oven and you will only be using your cookware at half its potential. And if you purchase too small, you’ll be preparing multiple batches of meals to feed your larger family. However, if you do a little research first, you’ll have the knowledge to choose the perfect size cookware. Some of the key factors to look for when searching for the perfect size Dutch oven, are quite simple. And while just a few of these factors are needed when searching, we’ll be discussing all that may apply. So, let’s begin, shall we? First, is the capacity. This number will determine how much liquid, usually measured in quarts, the cookware can hold. Furthermore, each quart typically equals 1-serving of food. So, a 7-quart Dutch oven will usually feed between 5-7 people. And if you cook for people who eat more, you may want to cook 2-3 servings per person instead. Dutch oven capacities typically range from 2 to 14-quarts or even larger. These sizes are just as diverse as the designs of cookware you will find. So, what is the best way to determine the size to purchase? It’s simple, take the number of people you will be cooking for and add a couple more quarts to the equation. So, if you feed a hungry family of 5 including yourself, take 5 plus 2 or 3 extra quarts. This will give you an ideal capacity of a 7 to 8-quart Dutch oven that you’ll need to purchase. However, quart size isn’t all you may need to consider. The diameter and depth can also play an important part, as you will see down below. Diameter can also be of significant importance. This can be measured in either inches or centimeters depending on which country you reside in. So, why is diameter important? Well, if you need to prepare a certain recipe for one thing. A recipe such as a large cut of meat like a roast or a turkey may require a larger diameter. Dutch ovens come in a wide variety of diameters, ranging anywhere from 4 inches to 20 inches and higher. Simply measure from one side of the Dutch oven to the other in a straight line to find the diameter. And do the same with cuts of large meat. Simply measure across to see if it will fit in your Dutch oven. The shape of the Dutch oven may also become a deciding factor as well. Furthermore, a round shaped Dutch oven might be better for baking bread or simmering stews. So, which to choose, a round or oval dutch ovens. While an oval shape will allow you to cook a turkey or chicken much easier. This is because an oval Dutch oven will work more like turkey or chicken roaster, shape-wise anyway. So what size dutch oven for a whole chicken, you might ask? Well, it all depends on the size of the bird. And you’ll want to measure before cooking. Dutch oven depth often times will play an even bigger role when deciding which Dutch oven to purchase. This is because roasts, turkeys, chickens, and ham will need to fit inside the cookware. All, while the lid is able to securely close. If you want to play it safe, purchase an extra deep Dutch oven if you are unsure of what depth you will need. Likewise, most deep Dutch ovens are specifically designed to cook larger cuts of meat. This will not only save you time but also the hassle of guessing how deep of a Dutch oven you’ll need. And just like measuring the diameter, simply measure from the bottom of the Dutch oven to the top. This will give you the depth which is great to know for baking and roasting recipes. Likewise, measure your food, if possible, before preparing the meal. This will prevent overflow and spillage from overfilling. Down below is Dutch oven size chart that shows the most popular Dutch oven sizes. This chart will break down Dutch ovens by diameter, depth, capacity, and capacity measures in quarts. Furthermore, this chart will give you a better understanding of which size Dutch oven to buy. This chart will also apply to Lodge Dutch oven sizes as well. If you happen to live alone or have a small family, which size Dutch oven to buy? Well, you probably don’t require a large capacity piece of cookware. 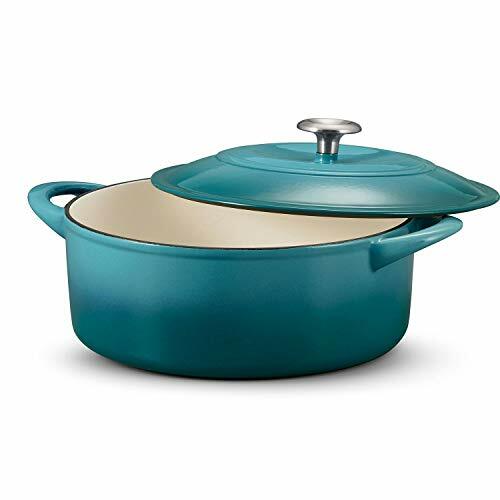 And our pick is the Le Creuset Signature 2-Quart enameled cast-iron Dutch oven. And in our opinion, this is one of the best size Le Creuset Dutch oven types available. This Dutch oven will answer the question, what size dutch oven for a family of 4? This is because it will easily feed up to 4 people and it will also reduce waste and clean-up time. Furthermore, it will also be the perfect size for starter families and couples as well. So, what if you have a larger family? Well, keep reading and discover our pick for larger families. If you are asking yourself what is considered a large Dutch oven, The Tramontina 6.5 Quart Dutch oven may answer your question. With larger families come more hungry mouths to feed. This is no surprise, of course. However, some may be surprised at how many people underestimate size when purchasing. That is why our pick is the Tramontina 6.5 Quart Enameled Cast Iron Dutch Oven. This Dutch oven will easily feed 6 to 8 people for family dinners, parties, and get-togethers. And, it will definitely be your go-to cookware for large batches of stews, soups, and much more. Plus, clean-up is always a snap with its nonstick enameled coating. What Size Dutch Oven Should I Buy For Camping? Camping with a Dutch oven can be a rewarding outdoor experience to share with the whole family. This is also true for hiking trips, scouting outings, and picnics. And like finding the perfect size for indoor Dutch ovens, camping cookware also has its key size factors to consider. A quality camping Dutch oven adds outdoor ruggedness with the convenience indoor cooking. And this brings us to our choice of camping cookware. The Lodge Seasoned 8-Quart Cast Iron Deep Camp Dutch Oven. This product offers a large 8-quart capacity and will generally serve 8-12 hungry campers. And if cleanup is an issue, foil or parchment paper liners can be purchased as well. Simply place the liners inside the Dutch oven and prepare your meal inside the liners. Finally, after serving your meal, lift the liner out of the Dutch oven, save the leftovers and discard the liner. This will not only eliminate clean-up but will also save your cast-iron seasoned cooking surface. 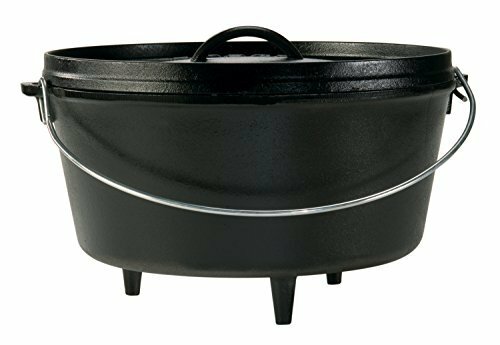 With that said, The Lodge Seasoned 8-Quart Cast Iron Deep Camp Dutch Oven will make a great choice for any outdoor cooking experience. Thank you for viewing our article on Which Size Dutch Oven To Buy? We hope you are able to better choose the right size Dutch oven for your home. If you would like to learn about how to clean and maintain a cast-iron Dutch oven, then click here. And if you would like to learn how to maintain and clean an enameled Dutch oven then you may click here. These articles will help you better understand how to prolong the life of your cast-iron Dutch ovens.